WHEN: Thursday 02/06/14 through Sunday 02/09/14. WHERE: Auto Club Raceway at the Pomona Fairplex. 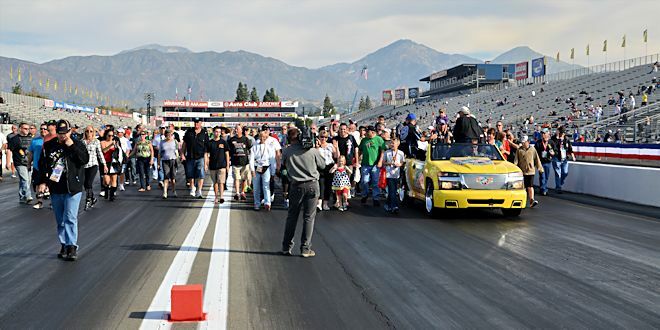 The 2014 NHRA “Mello Yello” Professional Drag Racing Series consists of 24 races and the first and last races are right here in Southern California. 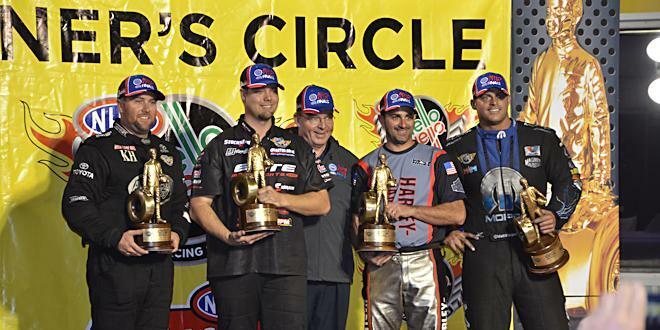 It begins with the Winternationals in February and ends with the Finals in November and both of those races are held at the Auto Club Raceway which is at the Pomona Fairplex. 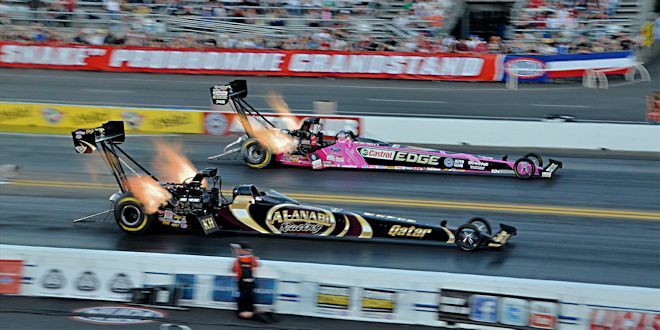 I’ve been an avid drag racing fan since I was a kid and I have to admit that I’ve only grown up from the neck down, at least as far as my enthusiasm for drag racing is concerned. I also go to other kinds of racing events, but none of ’em generate the excitement I experience at a drag race. Every ticket, including General Admission, gives you full-access to the pit area. You can wander around and meet the team owners, drivers, crew members, and other drag racing legends and dignitaries and most of them are quite willing to pose for photos and sign your shirt, hat, and other mementos. Thursday, Friday, and Saturday are qualifying days and Sunday is devoted to eliminations. Conventional wisdom says the “real” racing happens during eliminations, but there’s nothing “conventional” about drag racing. Many of the best runs and most spectacular things I’ve ever seen at a drag race occurred during qualifying and I’ve lost track of the times that my favorite cars didn’t qualify for Sunday’s elimination rounds. There’s lots of stuff to see besides the pit action and racing. 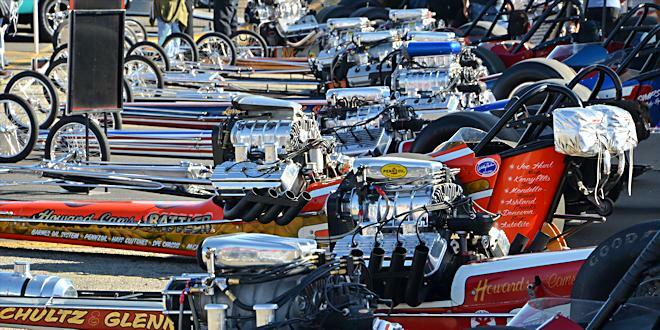 Among other things there’s a manufacturer’s midway where you can check out the latest performance products and vehicles and Nitro Alley where you’ll find a collection of famous dragsters from the past. Of course there’s also food and adult beverages along with plenty of team clothing and souvenirs for sale. 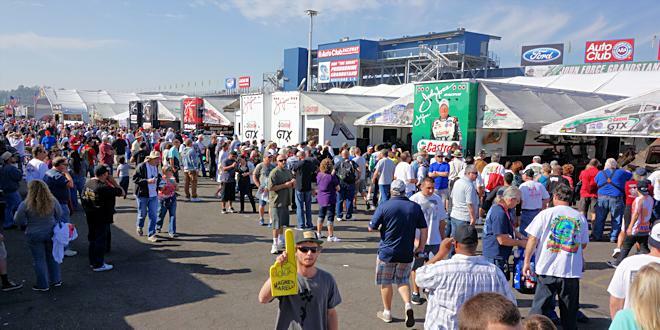 If meeting drivers, collecting autographs, and taking pit photos is your thing then you’ll want to consider going on Thursday or Friday because the crowds in the pits aren’t nearly as bad as on weekend days. On Saturday and especially on Sunday there are walls of spectators in front of all the popular pits, but if you’re patient and persistent you can eventually get to the front of the wall. You can sit just about anywhere on Thursday, Friday, and to a lesser extent on Saturday without a reserved seat ticket. A notable exception is the bleachers on the West side of the track are usually closed on Thursday. On Sunday the seats on both sides of the track are reserved to a little past half-track (or as I call it, the 200+ MPH point). Take hearing protection with you or purchase some on your way in! Seriously! You should also consider taking seat cushions or a blanket to sit on and to hold your place in the grandstands while you’re walking around. There are no guarantees that it will work if you don’t have reserved seating, but people are usually pretty good about respecting “marked” spots in the stands. There’s a tram that runs continuously from the main entrance of the raceway to the Wally Parks NHRA Motorsport Museum and the tram ride and admission to the museum are free during all four days of the Winternationals. On Sunday morning they have driver introductions in the staging area in front of the timing tower and fans are invited. This starts at around 9:30 AM and is followed by a “Track Walk” which allows spectators to accompany a racing legend or dignitary (like Don Prudhomme and Tom McEwen at the 2013 Finals) on a walk down the very track surface that the cars run on. Shortly after the last race on Sunday they’ll set up a platform in the staging lanes or staging area in front of the timing tower and present the winning drivers with their Wallies (trophies). Like the driver introductions and track walk, spectators can come on down and join the celebration. Staying for this is a great way to avoid the gridlock that always occurs when everyone tries to leave the Fairplex at once and it’s a perfect opportunity to get some photos of the winning drivers and their trophies. Please note that the NHRA has changed the qualifying schedule this year: In previous years the Pro classes (Top Fuel, Funny Car, and Pro Stock) had one qualifying session on Thursday, one qualifying session on Friday, and two qualifying sessions on Saturday, but this year Thursday will be dedicated exclusively to Sportsman and Comp Eliminator class qualifying and the Pro classes will have two qualifying sessions on both Friday and Saturday.